The triple air component is self evident. He also wrote about his experiences in space which is a further expression of thinking air element –blue. Silver is aligned to home, security and protection. Beauty and refinement are at the heart of providing structure with precision –light blue inside dark green. All of this fits perfectly for an architect. Sensitivity surrounds passion and desire –red inside silver. Raw talent and creativity successfully meet an emotional response to environment. Dark green at the center conveys productivity, staying on task and honing talent into solid form. 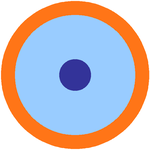 The ability to collaborate ideas –dark blue inside light blue- is enhanced with enthusiasm and visionary talent –orange. He worked with his brother to create some of America’s most beloved music. Light blue is aligned to art, music and culture. Eccentricity and universal thought –dark blue- is strengthened by the added qualities of understanding people and their cultural behavior -light blue at the center. Bright blue conveys communication. This Belgian cartoonist drew from ideas –light blue- inside a sensitive, receptive personality -silver. The desire to mold and structure through repetitive activity can be seen through dark green. Raw talent and a mythic sense of the world meet with a sensitive view of his environment –red inside silver. 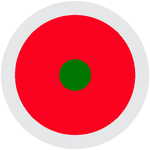 Passion is given form –dark green inside red. His films are tireless works of art. Thought systems are expanded through a visionary mode -blues inside orange. 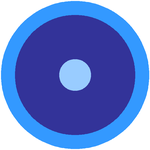 A dark blue center conveys intelligence, rebellion, emotional detachment and truth seeking. This Harvard scholar brought the mind altering, consciousness raising drug –dark blue and orange- to the culture –light blue.